At least five people have died of leptospirosis in the aftermath of Typhoon Washi in the southern Philippines, officials say. According to the Department of Health, 128 people in Cagayan de Oro City have also been diagnosed as of 1 January. Leptospirosis is caused by Leptospira bacteria found in water contaminated by animal urine in warmer climates. Symptoms include fever and vomiting and may take an average of 10 days to develop. Flooding caused by heavy rain helps spread the bacteria. Dr David Mendoza from the regional health office said that there were also 83 cases of leptospirosis recorded in Iligan City, with 41 already discharged. An updated figure for the number of fatalities and cases would be released later in the day, he told the BBC. 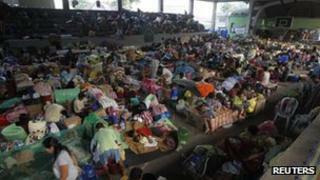 Typhoon Washi struck from 16 to 18 December, devastating the cities of Cagayan de Oro and Iligan. Many of those who died were sleeping as the typhoon caused rivers to burst their banks, leading to landslides. Entire villages were washed away. A total of 1,249 people are now known to have died in the floods.